being a woman in africa is no easy thing. basically, you are meant to churn out kids (probably starting from the age of 11), and cook, and that's about it. i've written about poo, peeing, vomiting, now let's talk about something of the female persusion and a little more sensitive - guys, look away, cover your eyes, go talk about chicks and cars or something. this is about menstruation. let me preface this with the fact that i have always noticed that unlike any other trip where your baggage becomes more and more unbearable and cumbersome over time, when i travel to congo my bag alwyas gets smaller and smaller. sure, i give stuff away, and yeah, i guess i lose things, but really, in the end everything just gets selectively removed. but it's nothing to worry about, theft is not about valuables, more about necessity. they won't take your laptop, because they won't know what to do with it (no one has outlets)...but a flashlight or cell phone better be locked up. your fancy patagonia fleece isn't that vulnerable, just watch out for your shoes and socks. they will never take your camera, just your toilet paper. and so it was, the feeling of a lighter bag is a good thing right? until that day of the month came, i searched confidently in my bag for my well planned stash of tampons and maxipads. 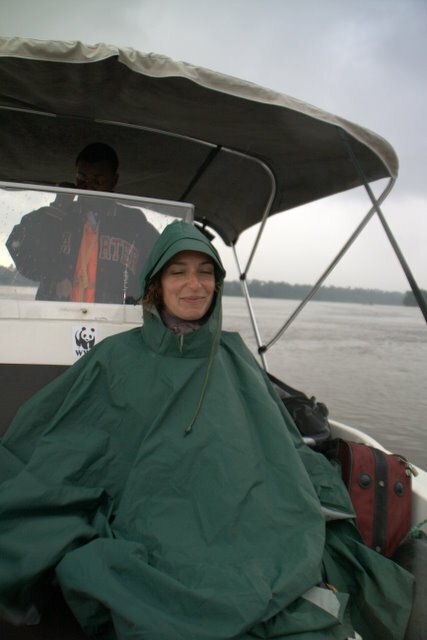 i'm travelling on a tiny speedboat for 2 days on the congo river with 4 dudes. we stop like, once every 5 hours at villages that consist of huts. i have a total of 400 congolese francs on me (that's less than 40 cents. don't even get me started on the economics of this trip, and how all my budgeted money was spent in one day covering for johannes, i am pretty iritated at being poor). oh, and it is pouring rain and everything i own is either soaked in sweat, rain, or covered in gasoline. oh, and i'm piss drunk on palm wine that i've been sipping out of a recycled beer bottle. i ask ino to borrow money he's all, what do you need, i'll buy it! you want some beer? he buys beer and hands me one. recall that we are stopping in hut villages, that with the rain now are muddy hut villages. in one village, i asked a guy if i could use his toilet. he brought me to his hut, and showed me to the corner in which i could pee, in front of his family and his ducks. i wonder what the female residents do with thier monthly task...this is more mind boggling than indonesian turlets. i am back in the boat, i sit uncomfortably and sip my palm wine, pondering gender issues when we stop in the town of bolobo to spend the night. i am drunk, hungover, tired, and still entirely soaked and cold from the earlier rain, and quite ready to be done with this endless bumpy boat trip (i am actually looking forward to a cold brown shower in dusty hectic kinshasa?). we check in with the missionaries, get hassled by the CGM and then wander off into the town in search of food and booze. we find a little bar with really loud music that also just happens to be a pharmacy! what luck! everyone sits in plastic chairs and orders beer and peanuts and i make an excuse and sneakinto the little store. as a mondele, it is impossible to do anything without being followed by at least 10 children so they all join me in the pharmacy to watch. this is SO embarassing. i have a hard enough time buying tampons at the supermarket, this is something entirely different. i scan the shelves which are full of malaria medicine, eye drops and other stuff and finally notice a box that has the same color and design at those always brand maxi pads, but the text is in chinese. i point to those, i'll take one. my little audience chatters in response and all the blood rushes to my face. the pharmacy guy opens the carboard box with an exacto knife and pulls out a large handy plastic carrying case of what seem like adult diapers. oh no oh no, these are from the 80s, or what comes out of those automatic machines in airport restrooms. i want to die. just imagine me walking up to the guys at the bar, with my little plastic suitcase, hey guys i just bought these, thought they might come in handy! i negotiate a purchase by the unit, which means the guy opens the package and pulls a thick pad out, clearly showing me the blue medicinal strip and then waves it around, using it for emphasis as we do business. everyone is talking, yelling, i can feel my heartbeat in my face. it's hot, i'm sweating, i want to crawl under a rock and die. i look in my wallet and realize i don't have enough cash and really need to turn up the bargaining. we argue and argue back and forth, i offer euros, my phone number, he then displays the wings for extra protection and squeezes it to demonstrate the absorbency, I'm half expecting him to pour blue liquid on it like in the commercial. somehow we come to an agreement and i get a package of tissues thrown in with a deal i can afford. yes! as it turns out they don't actually have the tissues, someone will bring them to me in the bar. the perfect alibi for when i get back to my colleagues and someone asks me what took so long! i stuff 2 thick diaper like items into the pockets of my cargo pants saddle up to the plastic table and down some beer. momentarily, a little boy brings me the tissues and i thank him and confidently wave him away. so i spent about 20cents on one rather thick diaper. let's now imagine i'm a shy 14 year old girl who has no income whose family lives in a thatch hut a can barely afford enough manioc to feed my 6 siblings. it's no wonder they stole my tampons, that stuff is luxury.